The known history of the Corner Shop goes back as early as 1861, where the Census shows the site was occupied by Benjamin Butler - named as "a Grocer and Provision Merchant." Ten years on, the 1871 Census describes the site as a "Grocers Shop" being run by Samuel Wood. In 1881, Census records show the site changed owners again, with William Ratherham, who is described as a "chemist and druggist," taking over as occupier. During this time in the mid-to-late 1800s, the Burill family ran a grocer's shop in Shepherds Row-- now, Shadowbrook Lane. 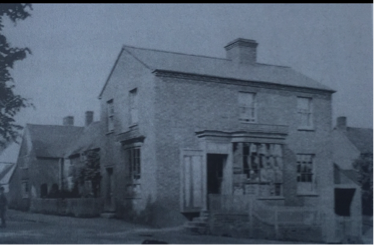 When the Burrills took over the Corner Shop, the shop on Shadowbrook lane became known as "The Bottom Shop" and the Corner Shop became known as "The Top Shop." "In the early hours of the morning on 13th February, a burglary was foiled at Mr. Burrill's shop in Hampton in Arden. Burglars attempted to removed a 32 lb ham hanging in the window. The window was broken with a brick wrapped in a blanket. The ham could not be pulled through the small glass panes and fell back into the shop, breaking several jars of jam. The noise woke the residents in the rooms above the shop. The police reported, "the burglars fled without their booty." Memories of 1914 to 1921 record both The Top Shop and The Bottom Shop as being both owned and run by the Burrills. At the same time, Dorothy Burrill was operating a Millinery business. In 1935, it was said that Mr. Burrill's Top Shop had changed considerably. Originally there was no entrance on the High Street, rather the doorway was up some steps at the top of Marsh Lane. The Top Shop was a chemist and grocery shop, and at one time it served as the village post office. However, Sir Frederick Peel thought the shop was too public a location for a post office, especially since much of his London communication was sent from there. So, the post office was moved across the road. John Burill's son, Harvey, later went on to run the shop. Around 1987, the James family came from Sutton Coldfield and took over running the shop, with Malcolm and Maureen soon becoming a mainstay of the local community. Their son Nick now runs the village bakery and Naughty Nick's. Tina O'Mahoney took over the Corner Shop in 2007. She had lived in the village for many years and, more recently, lived over at the shop.